In the southeast corner of Arizona stands a destination that proves that good advertising works. How good? In 1977 our family took a trip to Costa Rica. Rather than flying out of Los Angeles my father decided to make a road trip out of our summer vacation. He loaded mom and two kids (10 and 14) into the old Impala and headed from Los Osos, California, through the southwestern United States, and ending up at the New Orleans International Airport for the flight out. 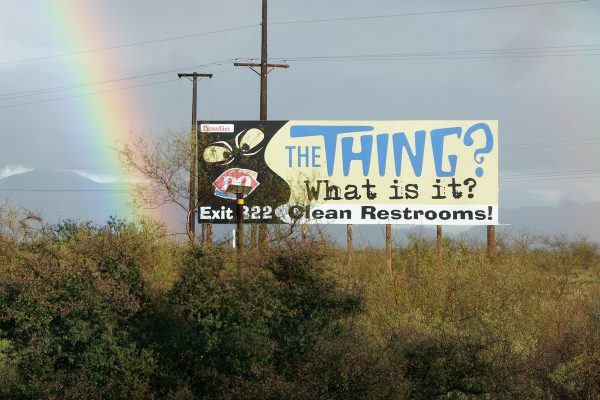 Somewhere in the middle of the Arizona desert we saw a yellow billboard on the side of Interstate 10 proclaiming “The Thing?” This was followed by another, then another, then yet another. Having us look out for “The Thing?” billboards was a good way of keeping two rowdy boys from making a ruckus in the back seat. And they went on for what seemed like hours. “Was that ‘The Thing? '” mom would ask every time we started making noise, or kicking the seat in front of us, or when the older (not me) would start to torment the younger (me) out of boredom. Suddenly we were looking out the windows of the green Chevy, scanning the Arizona desert for any sign of the mysterious “Thing.” We never did see it. In time the billboards stopped and we had to turn to other ways of amusing ourselves through the scenery of rocks and scrub. So, what might this have to do with good advertising? In 2009 I took one of my famous “leave work on Friday, get back by Sunday (or usually really early Monday) and see how far I can go” road trips. My destination was the Titan Missile Museum in Green Valley, Arizona, just south of Tucson. I’ll get into that later, but after leaving the museum I somehow ended up on I-10 heading east where I saw the billboard on the side of the freeway. “The Thing?” The Thing! THE THING! I had to go. It called to me like the Sirens called to Greek sailors. I had no idea where it was. I had no idea WHAT it was. But I had time to explore, and so there I went. A few miles down I-10 and there was another one. “The Thing? Mystery of the desert.” And more. “The Thing? It’s a wonder!” “The Thing? What is it? Clean Restrooms!” Any advertising that works after over three decades and takes a person 50 miles out of their way has to be called a success. So, what is this “The Thing?” you might ask. Well, I’m not telling. Google it if you must, but one of the sad things about the Internet – my own blog included – is that it takes the mystery out of travel. There’s nowhere to go where you can’t go online for ten minutes and see hundreds of photos of what you’ll find there. Of course the upside is that you discover places like the Titan Missile Museum in Green Valley, Arizona. This new website and blog will feature photographs and tales from my travels, both near home and across the world. You’ll find stories from my recent trips, and stories from years past. All will be sprinkled with plenty of photos, some that you can buy from my store and others that didn’t make the cut for printing but complement my stories. I hope you enjoy your visit, and please leave a comment and sign up for updates by taking my survey over there on the right (or down below if you’re on a smart phone.) You’ll never be spammed and I don’t have a marketing campaign, it’s just my way to share The Way I See Things with you.